Realizing the limited capabilities in the Su-15 Flagon A, the USSR soon realized, of changes to be made to the plane, a new cranked delta wing was used, with the improved Taifun-M radar (NATO "Twin Scan") and provision for UPK-23-250 gun pod or R-60 (AA-8 "Aphid") short-range air-to-air missiles. Again this is a revamp of Boopidoo`s Flagon F, few details in the inis were changed. thanks to Boopidoo to include this important red bird. A new set of high 4096x4096 resolution has been added, some stenciling was added too, with a new template made by me, again, available if you want it. AA-3C and AA-3D have been tweaked by Snailman and the UPK-23-250 has been reskined by me. If i forgot to credit anyone here i beg my apologies, please let me know and i will update it. The Su-15 "Flagon" was developed to replace the less capables Su-9/11 in the homeland interception duties, among the improvements were twin engines, side mounted intakes to replace the nose one. The plane was powered with 2 Tumanski R-11F2S-300 engines. The side intakes change allowed to mount the more powerful RP-22 Oryol-D (NATO 'Skip Spin') in the nose. The initial delta wing in this plane had poor take-off and landing characteristics, so, a later variant was developed. The model used was made by Boopidoo who i thank for it, some ini edits were made by me. 2 High 4096x4096 res skins were made by me with a whole, new, more detailed template, available if requested, the first skin depicts some examples of the 57th IAP, 10th OA PVO, based in Norilsk, and the other belongs to the Red Falcons Aerobatic team of the 60´s, this ones never carried bort numbers, info collected by Loborojo, who also i thank for the it. This variant was never applied tactical camouflage and was kept natural metal, i wasn´t able to collect info about the stencils, so, if anyone has it and want to share i will update the planes and will credit him/her. This plane is made mainly for high speed interceptions, so if you ran out of missiles and got into troubles and don´t want to ram your objective (which sometimes the soviet pilots were instructed to do so), dive as low as you can and run for home, missiles weren´t too reliables at that time and a gun was loooong needed, so that will be corrected in the next variant. If i forget to mention anyone who worked in the plane, my apologies, just let me know and i will correct it. 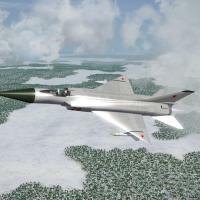 The Sukhoi Su-15 was developed primarily because of the Soviet Unions great need for a capable high-speed high-altitude interceptor in the 1950's. The Sukhoi design bureu was tasked with the construction of the swept-wing S-1 tactical fighter and the delta-winged T-3 interceptor. The Su-1 'Fitter' which first flew in 1955 later developed into the Su-7 which in turn developed into the very successful Su-17,20,22 variable wing geometry attack aircrafts. The T-3 on the other hand developed into the Su-7 'Fishpot'. Unfortunately the Su-9 lacked performance in both operational range as well as radar range. This led to the development of the Su-15 'Flagon', not counting the half-failure of Su-11 (a bigger version of the Su-9). The Su-15 after lots of prototypes first flew operationally in 1965. During it's operational time it guarded the Soviet Unions borders right up until the desintegration of the USSR. Production of the T-model began in 1971 and that later became TM with the modernised Taifun-M radar. The Su-15 had at this point evolved with extended wings to lower the high approroach speed and a spherical nosecone to make room for the bigger radar. The TM also had smaller inner weapon pylons under the wings to carry R-60 (AA-8 APHID) missiles, this was done to satisfy the need of a dogfighting capability. To further increase it's overall capability the under fuselage pylons were upgraded to being able to carry gunpods, attack rockets, rocket pods and bombs up to 500kg. Since only the gunpods has been used and has a functional fire-control system the other loadouts options must be seen as theoretical, although the carrying capability's still there. 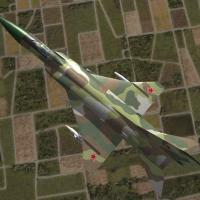 Simply extract the contents of the Su-15TM folder into your Mods\StrikeFighters2 folder. Chaff and flares have been added so you can spend more time flying, and less time dying! Invaluable testing by MoonJumper and kreelin which inspired me to improve the model way beyond my initial goals. Thanks Volksjaeger, Eruyi & Hawkwind for help with the original model. Armourdave gave me a lot of invaluable help and support, thanks David! Thanks to Mago for help and tutoring regarding Soviet avionics and especially the RWR. Without the help from you guys of the column5.us and SimHQ.com forums this wouldn't have happened.